This post contains affiliate links which means I may receive a small commission if you buy something through my link or ad. This does not change your cost it just helps keep this blog running. Thanks for your support! See my full advertising disclosure here for more information. 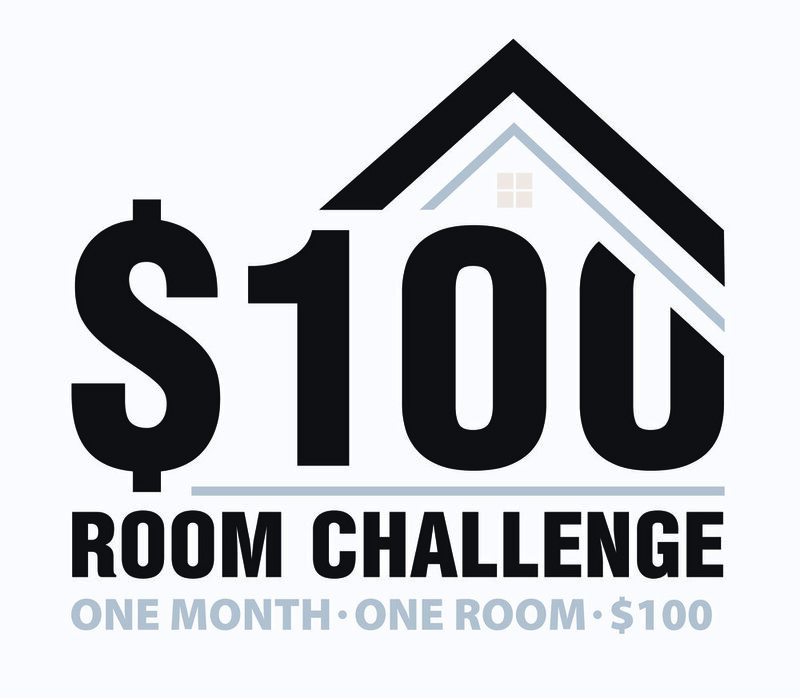 Already it is week 3 of the $100 Room Challenge where we have one month to finish a space for hundred dollars or less. 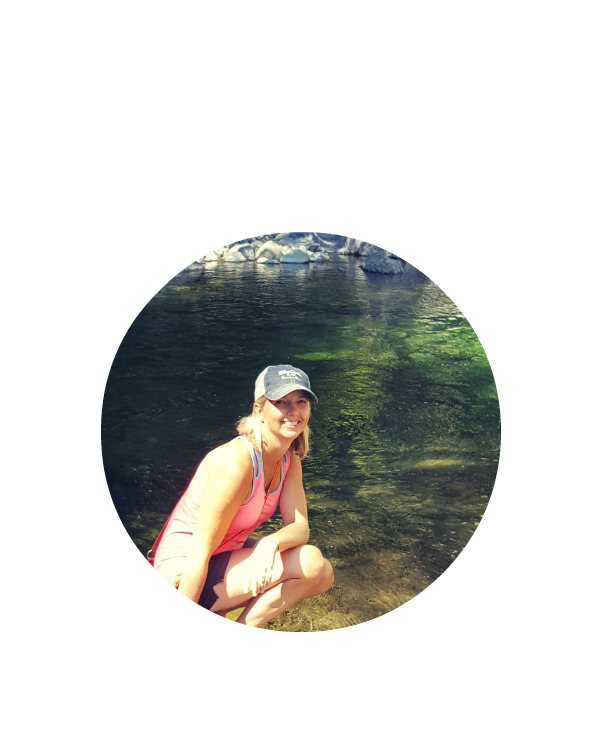 If this is your first visit , I highly recommend you hop on over to Erin’s Lemons, Lavender, and Laundry as she is the brilliant lady behind this idea. She’s been featured on the Rachel Ray show and the Jason Show! The room I chose to tackle is our small kitchen nook. We live in a manufactured home. Rather than use the designated dining area for dining, we converted that space for the wood stove. At the time it seemed like a brilliant idea because the breakfast area seemed soo big after living in a single-wide for years. Ha…little did we know that with a bigger home + more stuff = little space. Week one entailed the plan and breaking down the cost for each step. Week two saw a huge change where we added wooden cornices and sheer curtains. 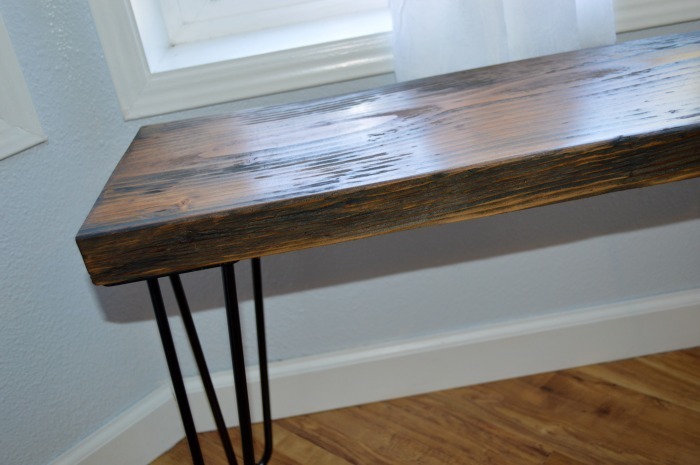 This week the goal is to build a rustic industrial style bench. How is this possible, you ask? A lot of digging through what we already have e.g., stain, screws, sandpaper, wood, pvc piping, etc. Check out the last two weeks to see how. Sometimes when you visualize a space and you find your inspiration, you’re not sure whether or not you can achieve that vision. I’m still in a bit of shock at how much I love the new window treatment. Elizabeth was so right. It completely changed the vibe and is a lot more welcoming than it was before. I was worried adding curtains would make the space feel closed in and dark, but I couldn’t have been further from the truth. 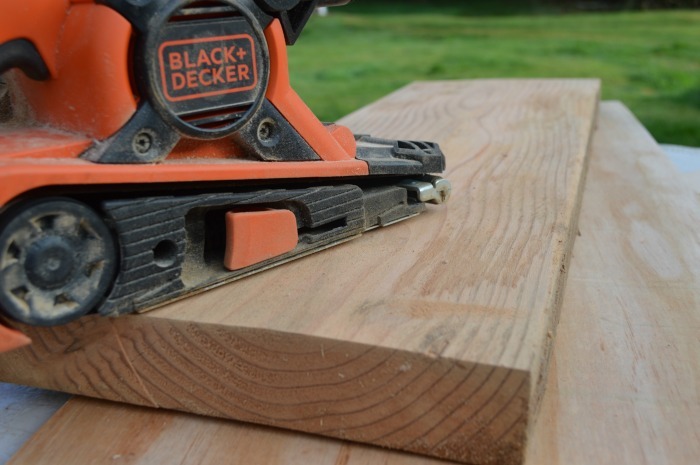 The purpose for building a bench is two fold. It’s a lot more affordable than buying a new chair and it will save space. Eventually that beautiful farm table will be passed down to our son. It’s just too big. 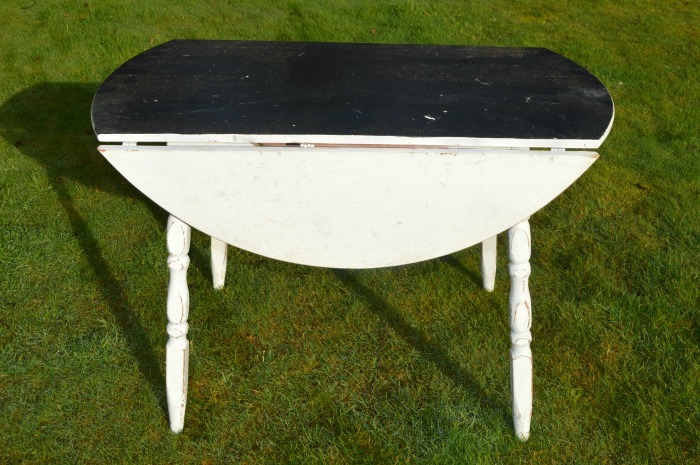 Next week we will be transforming this vintage drop leaf table that has been shoved in a corner of a storage shed. 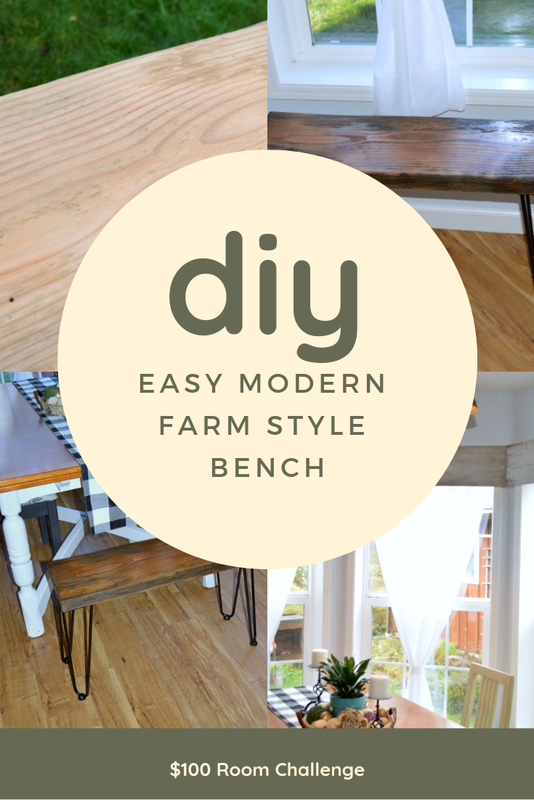 Originally I thought I would build the bench out of 2 x 4s we have in a pile. But when we took apart our mud room during the remodel, we had this 2 x 10 board that was used as a faux hall tree (Can I just say my version of a hall tree was down right u-g-l-y!). I ordered the 16” hairpin legs from Amazon as well as the floor protectors. The legs came with screws so that was pretty nice. Next sand. Begin with course grit then sand with a finer grit paper. I used 250. This guy is awesome! Careful though. If you are not ready, it will get away from you. LOL. Always should note to wear safety glasses and a dust mask. See those holes? Those got filled in with some brown mahogany color putty we had on hand. Once filled I then rubbed in some Min-Wax Prestain Wood Conditioner we had purchased a while ago when I refinished the top of our farm table. It helps prevent stain blotchiness. After 15 minutes I took a cotton t-shirt and rubbed it down (as directed) then began to stain. With a small sponge brush I added ebony color stain to the areas that were somewhat dark already. Then I took a small cotton rag and added provincial stain over the top. it gave it this look which I love. Let stain dry over night then add some indoor polyurethane. I had a can of satin leftover from our bathroom vanity so used that. What I love about spray poly vs can is no brush marks and it’s fast. With the vanity there has been no yellowing and the water beads like it’s supposed to. Attaching the legs was super easy. Basically position in each corner and attach with screws provided. Last step was to slide the floor protectors on and we’re done! And, as if I did it on purpose, she slides right between the table legs. Spaced saved. Brilliant! Just like that, week 3 is over and it’s time to roll our sleeves up and begin on week 4’s project. Can’t wait to see what it looks like with the vintage dropped leaf table. Stay tuned because it’s going to be amazing! …Or at least I hope it will be. But wait! 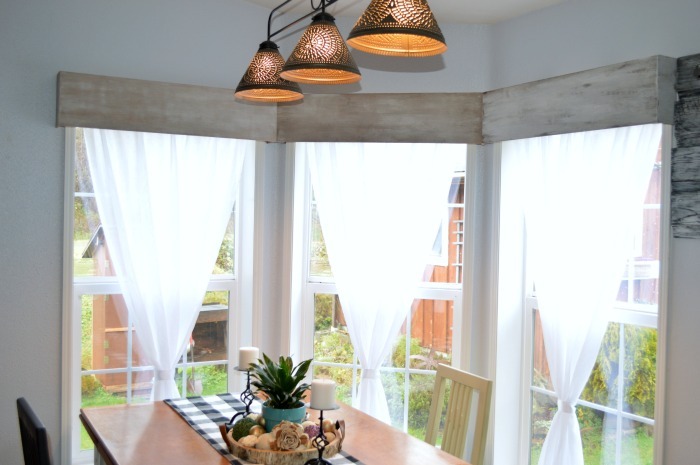 Make sure you check out some more amazing $100 Room Challenge transformations below. There’s something for everyone and I guarantee you will be inspired.